Are you ready for the Big Play? Play the Kroger Game Day Greats Instant Win Game 2017 for a chance to win amazing daily prizes! 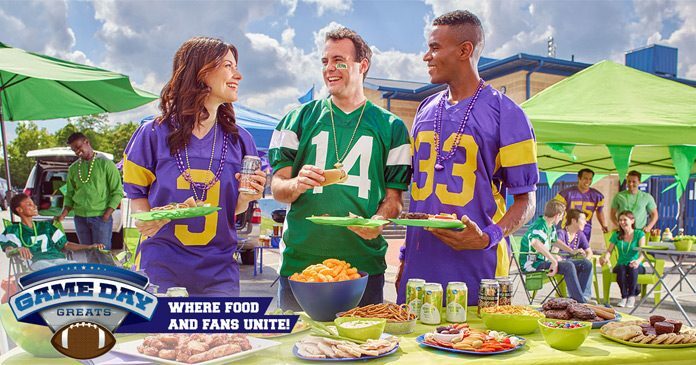 Visit GameDayGreats.com now through September 15th and you could win thousands of food prizes from Dannon, Pepsi, Kellogg’s, Wrigley, and more. Over $290,000 in instant prizes! During the Promotion Period, access www.GameDayGreats.com and sign in to your digital account tied to your participating Shopper’s Card. After signing in, select a target to throw a football for a chance to win. Eligibility: The Game Day Greats Instant Win Game is offered only to legal residents of the 50 United States (except FL, NY and RI) and the District of Columbia who are at least 18 years old at time of participation. Sweepstakes Period: The Promotion begins on or about 12:00am PT August 20, 2017 and ends on or about 11:59pm (PT) September 23, 2017. Limit: Limit one Game play/entry per person/household/account per day (12:00am until 11:59pm PT during the same 24 hour period) across all banners. Total ARV of all Instant Win Prizes: $299,931.50. Sponsor: The Kroger Co., 1014 Vine Street, Cincinnati, OH 45202. Administrator: YOU Technology, LLC, 1000 Marina Boulevard, Suite 300, Brisbane, CA 94005. For more information on the Kroger Game Day Greats Instant Win Game 2017, including official rules, visit http://www.gamedaygreats.com/ now!